In 1620 the Woking Palace (the manor house of the Royal Manor of Woking) was granted by James I to Sir Edward Zouch who abandoned it and built himself a new manor house at Hoe Bridge Place. With the abandonment of the Palace, the surrounding Park was turned over to farming and the tenants became known as farmers of ye Parke. This new phase probably gave rise to the building of farmhouses in the Park or the conversion of existing buildings to such use. According to the Church Rate Assessments of St Peter’s, there were as many as seven farmers of ye Parke in 1675 and this would suggest that there should have been a similar number of farmhouses. The Old House at the edge of or just within the Park would probably have been one of these. By 1685 there were only three farmers. A survey by John Holmes in 1709 shows the house as held by Nathaniel Atfeild. Local tradition has it that much of the materials used for the construction of the farmhouses in the Park and2 indeed some of the houses in the village were taken from the abandoned Palace. The use of Tudor bricks and reused fine quality timber in the building of The Old House would seem to indicate that these came from that source. 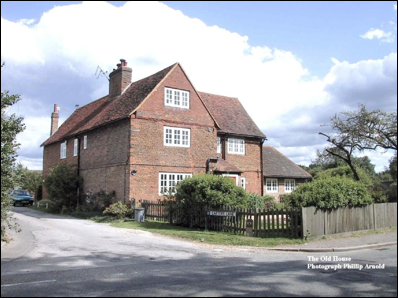 Originally, The Old House and Old House Cottage were built as a single farmhouse, Old House Cottage or part at least being used for farm purposes as a loading bay and large storage attic suggest. (DBRG Report 3738). The house had a number of previous names, Coziers in the early nineteenth century after John and Mary Cosier who were buried in St Peter’s churchyard and probably lived in The Old House. An estate plan of 1810 refers to the house as Town Farm and shows the adjacent fields south of Carters Lane as the farm lands. The Old House and the other farmhouses in the Park would have been built after the Palace was abandoned by Sir Edward Zouch. Simon Thurley in his book, Hampton Court, mentions that Charles I and Henrietta Maria left Hampton Court in 1625 following an outbreak of the plague, Charles moving to the lesser house of Woking while his wife moved to Nonsuch. Moreover, the St Peter’s Churchwardens’ Accounts of 1634 have an item, Paid for the feching of timbar from the ould place. It would appear, therefore, that the abandonment of the Palace must have occurred between 1625 and 1634. This would indicate that The Old House was probably built at some time during this period. The structural features and the external style of the house are typical of the 17th century. It is likely that the Old Manor House is similar in date as it shares certain features with Old House.